Albertville quarterback Wil Appleton celebrated joining the Auburn football team with his family, friends, coaches and teammates during a Dec. 6 ceremony. 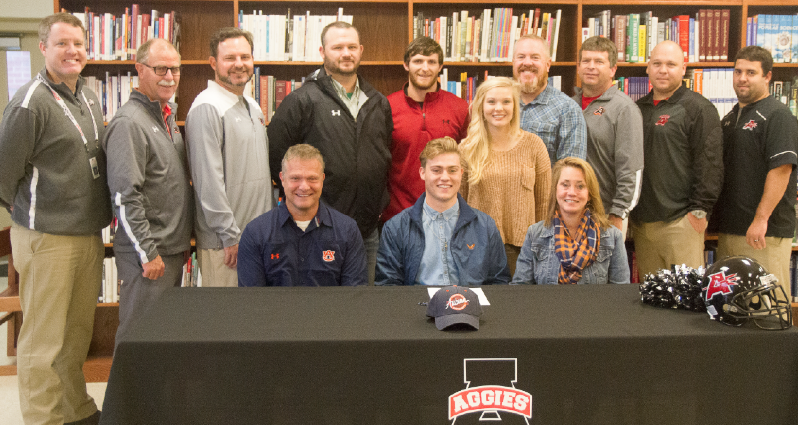 Pictured with him are his parents, Hank and Donna Appleton, and his sister, Blakley Appleton; and back row, from left, AHS Assistant Principal/Athletic Director Tyler Reeves, AHS head coach Dale Pruitt and Aggie assistant coaches Cliff Mitchell, Brock Rutledge, Daniel Garrett, Jimmy Patterson, Corey Head, David Boman and Luke Pruitt. Not pictured are assistant coaches Whit Ratliff and Brandon Lyles. Hank Appleton is a former Auburn player. Hank and Donna Appleton smile as they watch their son, Wil, sign his paperwork to become a member of the Auburn football program. Appleton passed for 2,574 yards and 23 touchdowns in two seasons with the Aggies. Wil Appleton is leaving the Aggie family to become a member of the Auburn family. The dual-threat Aggie senior quarterback is joining the Tiger football team as a preferred walk-on. 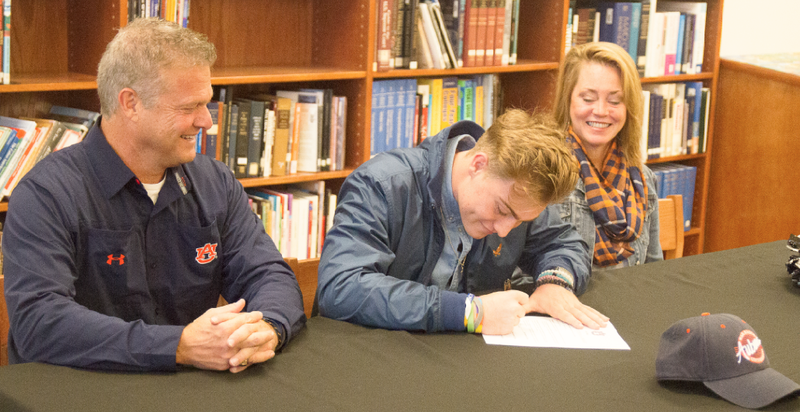 He celebrated his commitment to head coach Gus Malzahn’s program during a Dec. 6 ceremony in the AHS library. Appleton graduated early from Albertville and will enroll at Auburn in January. Tim Horton is Auburn’s running backs coach and recruiter for this area. He came by and visited with Aggie head coach Dale Pruitt during the spring, and they discussed Appleton’s future. “Coach Horton called me shortly after and told me if I didn’t get the scholarship offer I wanted, which is what happened, they want me at Auburn as a preferred walk on,” Appleton said. Appleton’s father, Hank, a former Collinsville star, played for Auburn in the early 1980s. Appleton won’t be eligible to practice with the Tigers until the spring, but he plans to attend their practices for the Jan. 2 Sugar Bowl against Oklahoma so he can start becoming familiar with their offense. “I’ll have some time to learn the playbook and everything so I’m not out there just completely lost,” he said. Appleton has dreamed of playing college football since childhood. “I feel like most kids growing up, especially in Alabama, they see football and they have that dream of, ‘I want to play college football,’” Appleton said. “Then you get a little realistic and realize it’s not as easy as saying you want to play college football. You have to do some things people don’t want to do. You’ve got to get up and you’ve got to go run, you’ve got to go throw, you’ve got to work on your trade. Appleton transferred from Westbrook Christian to Albertville during the summer before his junior season. He led the Aggies to their first back-to-back state playoff berths since a streak of three in a row from 1991-93. Appleton passed for 1,304 yards and eight touchdowns and rushed for 354 yards and six scores in 2015. In 2016, he was 93-of-149 passing for 1,270 yards and 15 touchdowns. He rushed 66 times for 286 yards and three TDs. Appleton suffered a broken arm on the first play of Albertville’s loss at Oxford on Sept. 16. He missed the remainder of that game and Albertville’s matchups against Boaz, Pell City and Fort Payne. He delivered a spectacular performance in his return to the lineup, rallying the Aggies from a 21-6 deficit to a 42-28 victory over Southside that clinched their postseason berth. Appleton completed 16-of-20 passes for 273 yards and three touchdowns and also rushed for a score. He also suffered injuries during his sophomore and junior seasons. “It’s definitely tough,” Appleton said. “My junior year I didn’t miss a game with it. But my 10th grade year and this past year, the hardest part is sitting there and watching your brothers out there playing and you can’t be out there with them. “I didn’t cry until I was sitting in the hospital and my mom keeps telling me the score of the Oxford game, and it’s getting a little bit worse and a little bit worse. I might not have made the biggest difference in the world, but being out there I wouldn’t have had any regrets or anything. “Sitting there and not being out there, especially getting hurt on the first play, it’s definitely tough because you want to be out there with everybody. Albertville head coach Dale Pruitt said he believes everyone is excited for Appleton and the opportunity he’s receiving to play college football. “Wil made major contributions to Albertville High School, to the Albertville community and to the Albertville football program in the last two years. He and his family both have,” Pruitt said. “We feel very happy for the young man and hope things go well for him. We know he will be successful in whatever he does. It’s been a real pleasure to coach him. “I’ve been in this 38 years, and I’ve never had a kid work any harder at his craft than Wil Appleton has. Wil has had several injuries in his career, and he’s never flinched. He’s always come back. Appleton expressed gratitude to Pruitt for the veteran coach’s contributions to his career. “He’s helped me so much,” Appleton said. “I want to coach when I get done playing, and I’ve learned so much from him just watching him go through everything. “The way he treats his players and the way he goes about practice, it’s such a business-like mentality, but he also has fun with it. “He’s old-fashioned. He’ll say some things and we’re like, ‘What does that mean,’ but it’s funny, it’s funny.